I find that spring rolls are often considered by many to be too tricky to prepare at home. Unsure of how to handle the rice paper or confused about what sort of ingredients would go inside, spring rolls often remain a restaurant-only option. Having said that, today I am excited to share this recipe in hopes that everyone will realize how easy and customizable spring rolls can be! Spring rolls can be served raw or fried and for this recipe, I have left them raw. 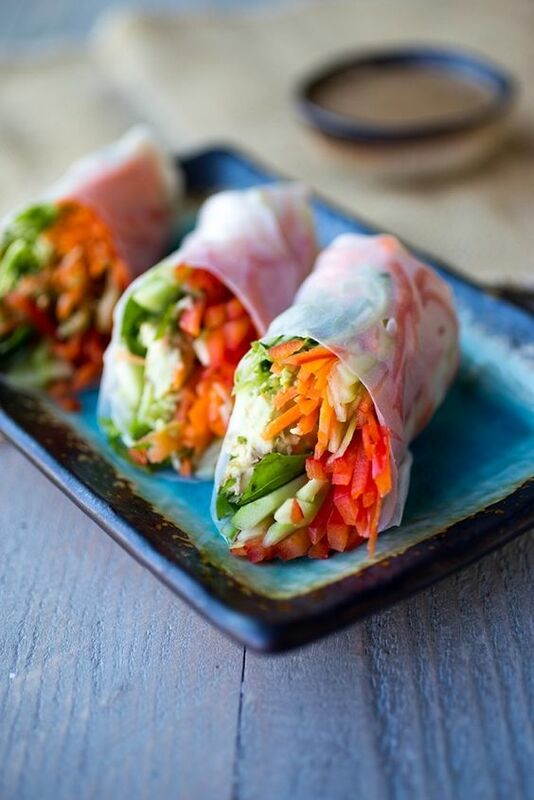 The slightly chewy rice paper coupled with the fresh veggies and absolutely addictive sauce are pretty irresistible. Additionally, these spring rolls are pretty fun to make and can involve the entire family! I’ve chosen to keep my spring rolls 100% veggie-based, but you are also free to add some cooked shrimp, chicken or any other protein of choice. Curious as to why I am using rice paper in a recipe even though I call my blog a paleo blog? After 6 years of following a paleo diet and modifying my food intake more times than I can count, I have settled on a diet that works perfectly for me. While I still eliminate most grains from my diet, I have re-introduced white rice and white rice-based products into my diet because my body does really well with it. Additionally, in going through all of the hormonal issues I’ve experienced over the past 6 years, I’ve actually recognized (and learned) that following a diet too-low in carbohydrates can have negative affects on my hormones, influencing not just my hormonal acne but my sleep patterns as well. For both of those reasons, I have happily re-introduced white rice. Even if white rice is not a part of your regular diet, these spring rolls are great to make on a weekend or cheat day. They are still relatively low in carbohydrates, minimally processed and packed with nutrients. Plus, as you’ll soon find out… the dipping sauce is also incredibly nutrient-dense and good enough to eat on its own. In fact, right after inhaling these spring rolls we prepared chicken satay for dinner using the exact same sauce and it was divine! I will certainly have to share that recipe with you all soon as well! 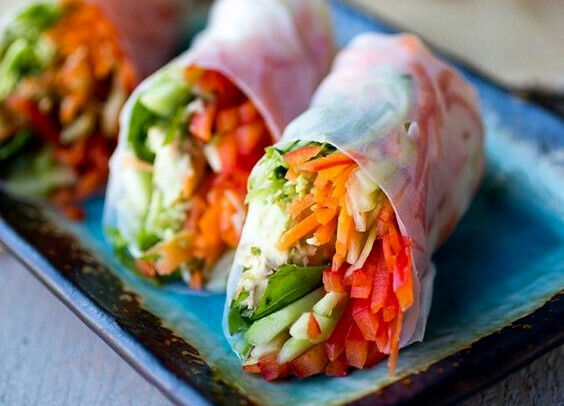 Prepare all spring roll ingredients and set aside, conveniently ready to add to your rolls. Individually rinse one rice paper sheet under moderately warm water or dip into a large bowl of warm water. (Either way works). Lay rice paper down on a clean plate. As it sits it will become more and more pliable and easy to work with. Add a bit of each spring roll ingredient to the middle of the rice paper sheet, measuring out how much would need to go in each roll depending on how many you are making. Once you've added all of the ingredients, fold in the sides of the roll as if you are about to roll a burrito. Once the sides are folded in, gently roll the rice paper around the ingredients going slowly as to not break the rice paper but also being sure to roll it as tightly as possible. The rice paper will stick to itself insuring a tightly rolled pocket of ingredients. Once you've completed all rolls, slice each on the diagonal and serve with your dipping sauce. We have a tree nut allergy. Would subbing the slmond butter for peanut butter work? It would. I try to keep my legume intake to a minimum, but a little peanut butter now and again won’t hurt you! Just make sure it only contains peanuts and maybe salt, stay away from stuff with added sugars, oils, etc.